Twenty years ago, Bill Clinton was president, Bono was still a rock star, and the jubilee movement to forgive poor countries' debts was perhaps the central preoccupation of development policy debates. The IMF and World Bank's Heavily Indebted Poor Countries initiative (aka HIPC) got the ball rolling in 1996, but it took another two decades of Bob Geldof concerts and negotiations between the Bretton Woods institutions, Paris Club creditors, and the debtors for the process to culminate with (hypothetically) 100 percent debt relief for 36 countries—30 of which were in Africa. Part of the reason you don't hear so much about debt relief any more is that it worked, at least for a while. Countries like Ghana saw its debt fall from 120 percent of GDP in 2000 to just 12 percent in 2006. Mozambique's fell from over 200 percent down to the mid-20s over a similar time period. While we should be careful about assigning a causal role to debt relief, economic growth rates across Africa were strong over the next decade, and the "Africa Rising" narrative took hold. Fast forward to 2018, and some of those same countries are gradually accumulating fairly significant sovereign debts again, which have led to talk of a new African debt crisis. The graphs above are based on the World Bank's International Debt Statistics, where we've pulled out numbers for the eight low- or lower-middle income African countries with the highest debt-to-GDP ratios today (ignoring a couple of small countries with total GDP below 10 billion dollars). Sudden fall: Several countries saw a dramatic decline in debt stocks after they benefited from the Multilateral Debt Relief Initiative in 2005. Gradual rise: The countries shown were chosen precisely because they have run up debts recently. In raw numbers, the figures look more extreme—Ghana's total sovereign debt is more than double today than it was at its peak before debt relief—but Ghana's economy has grown at a steady clip, so as a proportion of GDP the figure has risen only gradually. Commercialization: In the 2000s, most of the debt was owed to multilateral institutions like the World Bank and IMF and bilateral creditors who formed the Paris Club. Today, a much larger share of African debt is held by private banks and bondholders, so the dynamics of any hypothetical workout would be considerably different. Did the "Africa Rising" narrative feed premature enthusiasm for commercial bond offerings? In this my first post-IMF piece, I focus on whether the volume of Fund financing for SSA frontier markets… should have been greater, and whether such financing could have helped contain the indebtedness of those countries, many of which issued sovereign bonds… Has the Fund actually adapted to the need for [non-concessional loans]to these countries as they climb up the income ladder? Poor countries need development finance. The question is where they're going to get it. Economic growth converted a number of major African economies from low- into lower-middle income countries, and as Antoinette notes, in the process they seem to have fallen into an awkward middle ground: not facing any imminent crisis, they were too successful for most kinds of concessional finance from the multilateral financial institutions, but still fragile enough that the cost of finance from commercial creditors was high. Our analysis suggests the IMF has had a perennial bias toward optimism—and hence inaction—in the face of Africa's recent debt accumulation. Swearing "never again" after the last bout of debt relief, the World Bank and IMF agreed to periodically monitor borrowers and issue joint Debt Sustainability Analyses, which are basically forecasts of a country's economic growth, exports, government revenue, and debt levels. 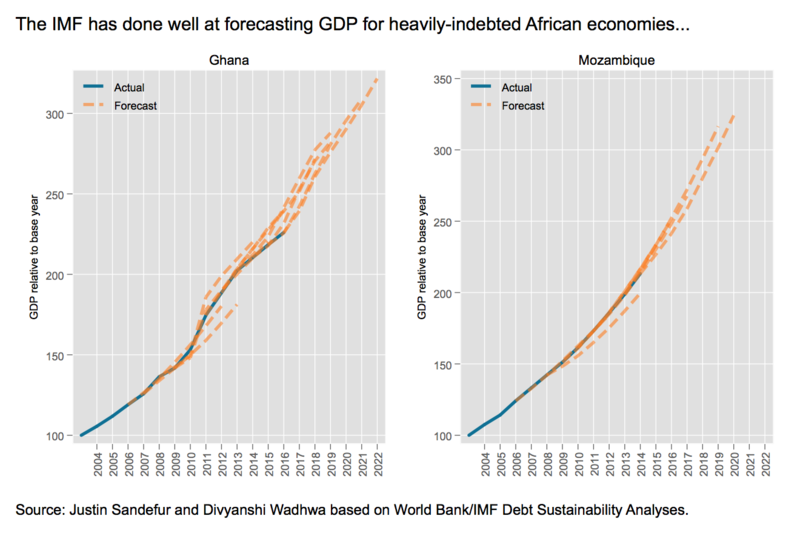 We downloaded the archived PDFs of these reports for the two most-heavily indebted African countries, Ghana and Mozambique, and decided to look at how well the forecasts panned out. On economic growth, the Bank and Fund performed pretty well (though for a slightly earlier period, my former colleague Ben Leo found some evidence of over-optimism in IMF growth projections for Africa as well). Forecasts were rosy, and reality mostly lived up to expectations. Contrast this with recent European crises. There the IMF was faulted for its wildly optimistic forecasts of growth rates in Greece, Spain, Italy, and Portugal (see Figures 2-6). No debt workout was needed, was the implicit message, because Greece could tighten its belt and grow its way out of distress. Each year, Greek GDP declined, and each year the IMF said they were about to turn a corner. While the Bank-Fund growth forecasts were much better for Ghana and Mozambique, their forecasts of the countries' debt levels have been comically wrong, year after year. As debt levels rose, the official Debt Sustainability Analyses predicted they would flatten out and soon fall. But they didn't. And this was not a one-off mistake. As the saying goes, "fool the IMF once, shame on Ghana; fool the IMF every year while your debt levels soar, maybe shame on the IMF too." To be fair to the Fund, Ghana and Mozambique are special cases. From 2011 to 2015 the Ghanaian government, feeling flush with potential oil revenues, basically told the IMF to take a hike. And the Mozambican government engaged in secretive borrowing while keeping both its creditors and citizens in the dark. 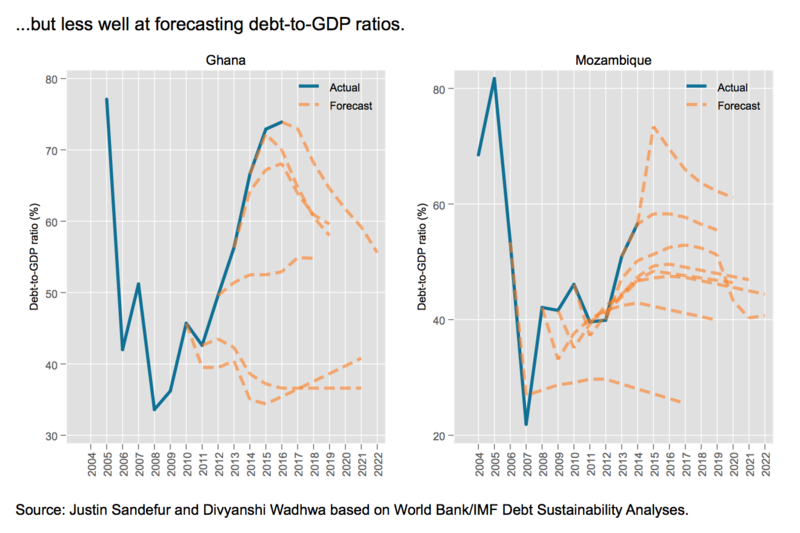 Nevertheless, reading the Debt Sustainability Analyses and looking at these graphs, the impression is that the World Bank and IMF treated their advice as forecasts. They repeatedly cautioned both countries to restrain their borrowing and spending, and forecast that they would comply. In hindsight, neither country had any intention of doing so. Are countries borrowing too much, or are multilateral institutions lending too little, forcing poor countries toward more expensive commercial loans? In either case, several African economies appear to be on course for a new period of debt distress and pressure for fiscal austerity. More, not less, multilateral lending in Africa might be a partial solution. Otherwise, it may soon be time for Bono and Bob Geldof to dust off their guitars. Thanks to numerous colleagues for comments. This post emerged from discussions with Masood Ahmed, Nancy Birdsall, Alan Gelb, John Hurley, Charles Kenny, Todd Moss, Mark Plant, Vij Ramachandran, and others, but the views expressed are ours alone.